The La Leche League International (LLLI) slogan: "Happy Mothers, Healthy Babies" has led many mothers and fathers to ask the question, does breastfeeding really contribute to happier mothers and healthier babies? Considering all the facts, I believe the answer is an emphatic "YES!" Whether you are a SUPER-STAR, or just a SUPER-MOM, breastfeeding your baby brings benefits to both of you, your family, and your community. That may sound too good to be true, but its not. I would add that nursing mothers also benefit from their bodies increased production of oxcytocin as a result of nursing, producing increased feelings of well being, happiness and love, and helping them to fall back to sleep more easily after night time feedings. When babies are born, they are completely sterile. They rely 100% on their mothers milk to culture their brand new digestive system, provide them with the immunities to protect them from germs and diseases, and supply them with the necessary nutrition to help them grow and develop optimally. A mothers body creates the perfect environment and nourishment for a growing fetus and a growing baby. Brain ~ Higher IQ- breastmilk support the growth of nerve tissue. 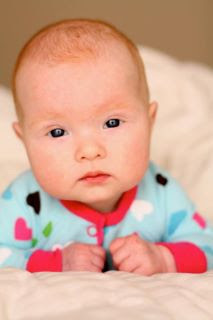 Eyes ~ Visual acuity better in breastfed babies. Ears ~ Fewer ear infections. Mouth ~ Less need for orthodontics, better facial muscle development, wider food palate as adults. Throat ~ Less likely to need tonsillectomies. Heart and Circulatory System ~ Lower heart rates as children, lower cholesterol as adults. Digestive System ~ Less diarrhea, lower risk for allergies, Crohns disease, and ulceritive colitis as adults. Immune System ~ Stronger immune system, respond better to vaccinations, decreases risk of childhood cancer. Endocrine System ~ Less risk of getting diabetes. Kidneys ~ Breast milk easier for Kidney's to process. Urinary Tract ~ Fewer infections in breastfed infants. Joints and muscles~ Juvenile Rheumatoid Arthritis less common in children who were breastfed. Skin ~ Less Eczema, healthier looking and better smelling skin. Growth ~ Breastfed babies leaner at one year, and less likely to be obese later in life. Bowels ~ Less constipation, stools have less offensive odor. If these benefits don't produce happier and healthier mothers, fathers, babies, and communities ~ I don't know what does.